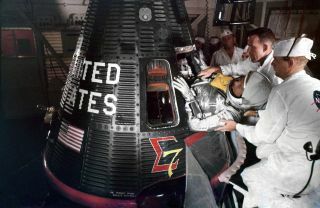 50 years ago, Wally Schirra became the fifth American in space, making the third orbital flight of the Mercury program. Schirra piloted his Sigma 7 capsule on a six-orbit mission that lasted more than nine hours on Oct. 3, 1962. Fifty years ago today, the United States launched its fifth astronaut into space. Walter M. "Wally" Schirra, Jr. rode his one-man Mercury spacecraft atop an Atlas rocket to orbit on Oct. 3, 1962. The nine-hour mission on the "Sigma 7" capsule was the longest to date for a U.S. flight and set the stage for the day-long final mission of the Mercury Program that followed. NASA astronaut Walter "Wally" Schirra launched aboard the "Sigma 7" Mercury spacecraft atop an Atlas rocket at 7:15:11 a.m. EST on Oct. 3, 1962 from Complex 14 at Cape Canaveral, Fla.
Click through to collectSPACE.com for a photo gallery from Retro Space Images, which recently released for sale an archive of almost 500 images from the Mercury-Atlas 8 mission.